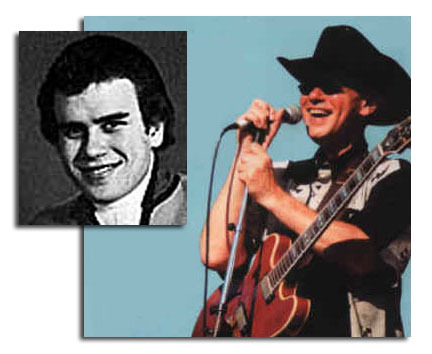 I just got word that Drake Levin, guitarist with Paul Revere & the Raiders, has succumbed to cancer today, passing away at the age of 62 at his home in San Francisco, with his wife Sandra at his side. I knew that Drake had cancer, and hoped to visit him, but I never had the chance. and now he’s gone. Best known as the guitar player for Paul Revere and The Raiders. In 1966, Levin was forced to leave the performing version of the Raiders when the draft beckoned; to avoid a combat assignment, he joined the National Guard (a common strategy in those days, engaged in by at least one future U.S. president), which enabled him to record with the group during his time off. The fact that this was done is an indication of how well Levin stood in with Revere, as well as his popularity with the fans and the worth of his playing, because producer Terry Melcher wasn’t above bringing in session players whenever he felt it necessary. Subsequently, after Phil Volk and Mike “Smitty” Smith left the band, Levin reteamed with them in Brotherhood, a promising trio signed to RCA that never got its full chance to be heard, owing to the members’ lingering contractual obligations to Columbia Records from their Raiders work. He subsequently demonstrated his worth as a guitarist by working with Ananda Shankar, Emitt Rhodes, and Lee Michaels, among other artists. He has also participated in reunions of various ex-members of the Raiders, and worked with his friend Phil Volk on several occasions. When Drake Levin played lead guitar with Paul and the Raiders, he and bass guitarman Phil Volk would pull-off a showstopper: “Drake on top of the left speaker and Phil on right speaker … dancing!” Those guys could and would dance plus play their instruments with superb results. Drake and Phil would dance on the speakers and play guitars behind their heads at the same time! Many guitarists can’t play at that level without even playing behind their heads! Once when they were performing at the Spanish Castle, a then- unknown Jimi Hendrix was in the audience, watching and learning from Drake. This was in 1963 or 1964 before Jimi made it big. Drake was obviously an influence to the guitar playing and showmanship of many musicians. Paul Schaefer of “The Late Show with David Letterman” is a fan. 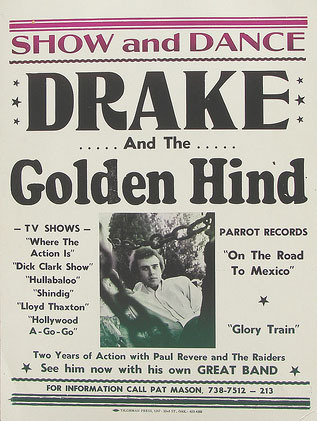 Drake was with Paul Revere & the Raiders starting in 1963 and on into ’67. While he was in the National Guard he would come to record with them in the studio and even fill in for Phil Volk during a couple of concerts, playing the bass. Drake, Smitty and Phil left the Raiders in 1967 to form The Brotherhood. Rest in peace, Drake. You will be missed. This is the first time I have gotten to see your website; it’s really groovy! You have so many pages for fans of “Louie, Louie” to browse! Paul Revere & the Raiders, namely Drake, Smitty, Phil, Mark, & Paul, could do “Louie, Louie” like no other. As you know, these five guys, along with the super cool Terry Melcher, wrote and recorded a follow-up song, entitled “Louie, Go Home”. They recorded two arrangements of it, both of them excellent. which I added several months ago. Thank you! Why Paul Revere & the Raiders aren’t in the Rock & Roll Hall of Fame is a cryin’ shame. However, I don’t know how you missed not mentioning the passing away last Thursday of Sky Saxon of the Seeds. What gives? 1) When Sky died, I was on a roadtrip, where my internet access was limited to one session a day at Starbucks. Things were kind of hectic that day. 2) Other than being a garage rock icon, I couldn’t figure out a LOUIE connection, or a personal story worth telling on this blog. I did mention his passing on my Facebook pages, for whatever that’s worth…. What to say about Drake Levin? He was a kind and gentle man .He played a mean guitar and I feel he was one of the best. I saw in the post above that Jimi H.saw him play.I only heard this week that he was ill again. My friends and I met him in 67.Phil Volk and he were going on a trip to Big Sur.This was the end of the raiders (the where the action is~ ones)and the beginning of the Brotherhood.They put out several Lp’s and never got the credit they deserved.My friends and I are heart broken. Hard to say how much he meant to us. Phil. Smitty and Drake were kind and played us a mini concert. I wanted to write to him and tell him about the joy he bought to my friendsand I. Now he is gone.Will miss u, Drake. Melody K. RIP Drake. I’m truly saddened by this one, & I offer my heartfelt condolences to his wife & family. Having had the honor & joy (it was really to see Drake & Phil, actually) of seeing the Raiders in concert 3 or 4 times, I was always absolutely Wowed by his skill & virtuosity. Such a fabulous talent, & kind, yet edgy sense of humor. I was sadden to hear of his death through the Louie Louie email group. Another musician added to rock ‘n’ roll heaven at such an early age. It was only a few years back that we lost another member of Drake’s era with the Raiders with the sudden death of Smitty. At least we know that the two of them are jammin’ together again. I saw Drake with the Raiders many years back in the 60’s, and again with Fang and Keith at the Zuke Festival in Hayward, CA during the summer of 1999, and several times with Curtis Lawson Band. May you rest in peace, Drake….thank you for all of the good times. I only heard this afternoon about Drake’s death. I am truly sorry to hear about, and offer my condolescences to his family and friends. I was crazy about him when The Raiders were on “Where The Action Is”, but unfortunately never got to see them in person.I used to think they were so much older than me and my friends, but I’m now 55 years old. So very sad to hear about Drake. used to live across from his mom and sis Lori in late 60s. me and friends were forever Raider and Brotherhood fans (friends) and will miss him. My father just sent me the notice that my mom’s cousin passed away. My mom & her brother grew up with Drake, his brother & sister. I never met Drake myself, but have always heard about him and am in touch with his sister (my second cousin??). In fact I just got some pictures from Lori, of my uncle and his kids with Drake at a club where he was playing a few years back, to give to my uncle. Although my mom passed away a few years ago, she always had nice things to say about her cousins and I am glad to have gotten to know at least one of them and their dad- who was my grandma’s brother and such a sweetheart! God Bless Drake’s family in this time. weeks(Ed McMahon, Farrah Fawcett, Michael Jackson, Billy Mays) and now Drake Levin. I’m a Raider fan and I’ll miss him greatly. I loved the raiders when i was growing up.Loved all the guys. Rest in peace, Drake, you were one really cool guy. Drake’s brother Jeff got me my first roadie gig, with the Grass Roots in 1971. I have worked in music ever since. My sympathies and prayers to Jeff and all Drake’s friends and family. Yeah, really. Rest in peace Drake Levin. Used to watch the raiders on Hullabaloo and shindig, in the mid 60’s here in little ol’ New Zealand. They were great. The original PR&R were the most energetic band of that era. Drakes work was very imaginative and improvisational. Just listen to Just Like Me (possibly the first R&R double tracked solo??) Ther’s Always Tomorrow, Louie Com Home, etc. Even with the newer member, Jim Valley, they had tremendous intelligent, energetic songs (Good Thing, Ups & Downs). Drake was a major influence on my playing (Started a 9years, am 56 now). I really don’t think all the guys, especially Drake, realized how influential they were and how much perople react to them on the classic stations. Play on, boys! Thanks for making the 60s and my life a happy one. Very touching that his wife was by his side. He really was a great player! I think he influenced rock and roll players to a great degree. Excellent and original exciting player! DRAKE, YOU WENT “STEPPIN’ OUT” ON US TOO EARLY. A GREAT LEAD GUITAR PLAYER IN A GREAT BAND. THE WORK YOU DID WITH THE RAIDERS ON “JUST LIKE ME”, “KICKS” AND “HUNGRY” SHOULD HAVE GOTTEN YOU AND THE BAND IN THE R & R HALL OF FAME A LONG TIME AGO. “HEY” TO SMITTY FROM ALL THE RAIDER FANS! I’ll miss you my friend. Sandra was a great companion and i know she will miss you most. RIP. Drake was a gentle man. His smile was like a sunrise. It’s was as if he had a joke inside him that he wasn’t sharing with anyone else. I first met him in 1966 when he loaned me his new black Thunderbird (I was still 15). He was working on Glory Train. His time with Sandra was his life. She made him a very lucky man indeed. I enjoyed how Drake played the guitar with Phil.I loved The Botherhood of Drake,Phil,Smitty and Mark.Phill and Drake were so so good together .I miss you Drake as well as Smitty.I cried when I heard about you and Smitty.Thank you Drake for being the meaniest guitar player on “Steppin Out’I loved the songs that you did.It keeps going through my mind even right now I hear you playing May you and Smitty rest in peace.I pray that I will hear your music and the rest of The Raiders throught the Halls of Heaven.